Dogfighting is a sadistic "contest" in which two dogs—specifically bred, conditioned, and trained to fight—are placed in a pit (generally a small arena enclosed by plywood walls) to fight each other for the spectators' entertainment and gambling. The injuries inflicted and sustained by dogs participating in dogfights are frequently severe, even fatal. The American pit bull terrier-type dogs used in the majority of these fights have been specifically bred and trained for fighting and are unrelenting in their attempts to overcome their opponents. With their extremely powerful jaws, they are able to inflict severe bruising, deep puncture wounds, and broken bones. Dogs used in these events often die of blood loss, shock, dehydration, exhaustion, or infection hours or even days after the fight. Other animals are often sacrificed as well; dogs who are born "cold," or won't fight, may be kept around to sic other dogs on. Yes. Numerous law enforcement raids have unearthed many disturbing facets of this illegal "sport." Young children are sometimes present at the events, which can promote insensitivity to animal suffering, enthusiasm for violence, and disrespect for the law. Illegal gambling is the norm at dogfights. Dog owners and spectators wager thousands of dollars on their favorites. Firearms and other weapons have been found at dogfights because of the large amounts of cash present. Dogfighting has also been connected to other kinds of violence—even homicide, according to newspaper reports. In addition, illegal drugs are often sold and used at dogfights. Why should dogfighting be a felony offense? There are several compelling reasons. Because dogfighting yields such large profits for participants, the minor penalties associated with misdemeanor convictions are not a sufficient deterrent. Dogfighters merely absorb these fines as part of the cost of doing business. The cruelty inherent in dogfighting should be punished by more than a slap on the wrist. Dogfighting is not a spur-of-the-moment act; it is a premeditated and cruel practice. Do some states already have felony laws? Yes. Dogfighting is a felony offense in all 50 states, and it is a felony offense under federal law as well. Should being a spectator also be a felony? Learn how to spot the signs of dogfighting. If you suspect dogfighting activity, alert your local law enforcement agency and urge officials to contact The HSUS for practical tools, advice and assistance. 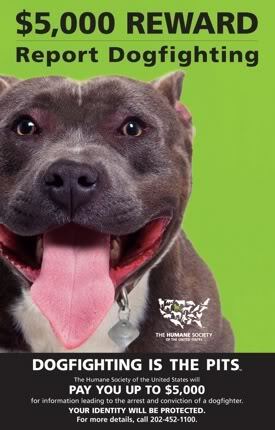 Post our dogfighting reward posters [PDF] in your community. For free posters, send us an email (include your name, address and the number of posters you'd like). Learn about our Pets for Life program and how to get involved in your community. If you live in one of the states where being a spectator or other aspects of dogfighting is still a misdemeanor, please write to your state legislators and urge them to make it a felony. Faron, Ed, and Chris Faron. The Complete Gamedog: a Guide to Breeding & Raising the American Pit Bull Terrier. Charlotte, NC: Walsworth Pub., 1995.